Oh sweet glorious gift exchanges, it’s that time again. 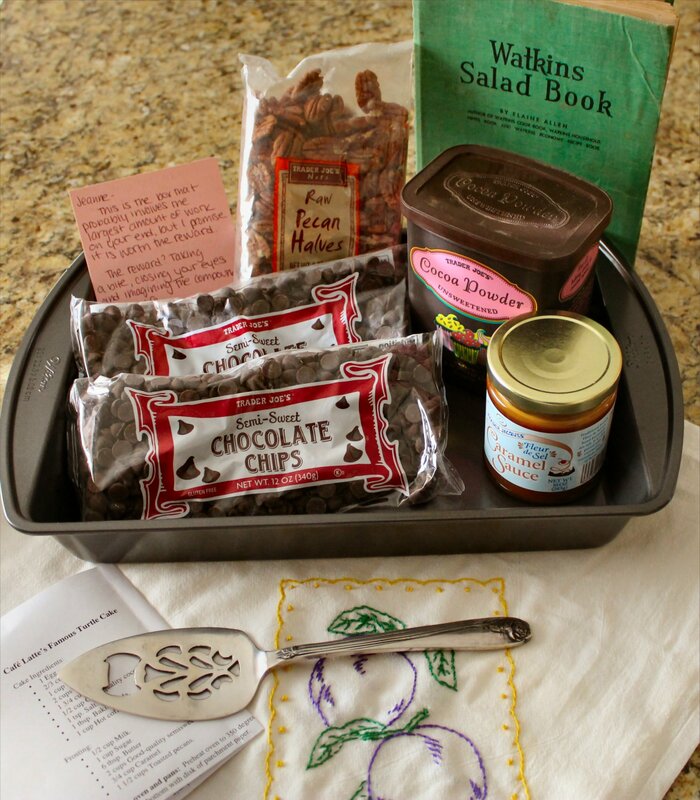 The time when our little circle of blogging buddies send care packages to each other; just because. See that cute tea towel? If I’m not mistaken, Kat’s sweet mother has been hand-stitching these one-of-a-kind towels for all of Kat’s OKMH boxes this year. How sweet is that? 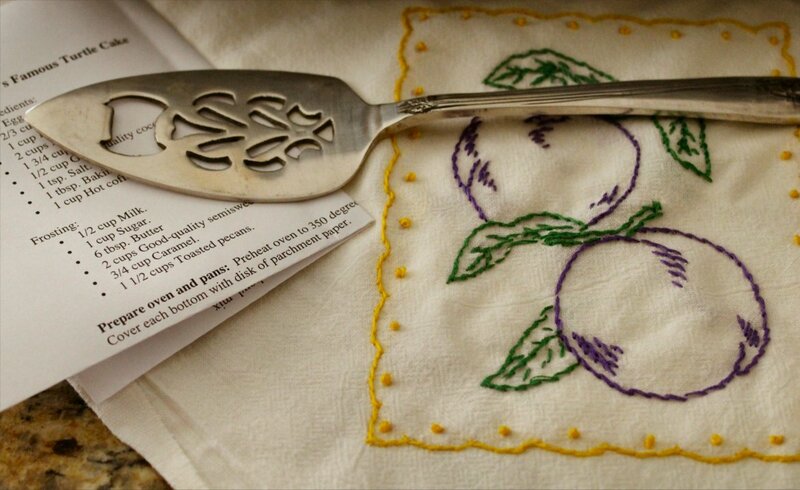 Mine has purple plums framed in a cheerful yellow border. Absolutely lovely. And get a load of that silver server. I have an old dainty one that I have to use with caution. This one is fancy AND sturdy. I’m talking ‘lift a turkey from the roaster’ sturdy. I think that cut-out at the end may even double as a beer bottle opener. How’s that for an all-purpose kitchen tool? This next treasure really made my heart melt. I don’t even remember how it first came up, but Kat showed off this vintage 1940’s cookbook a few weeks ago and I immediately swooned. 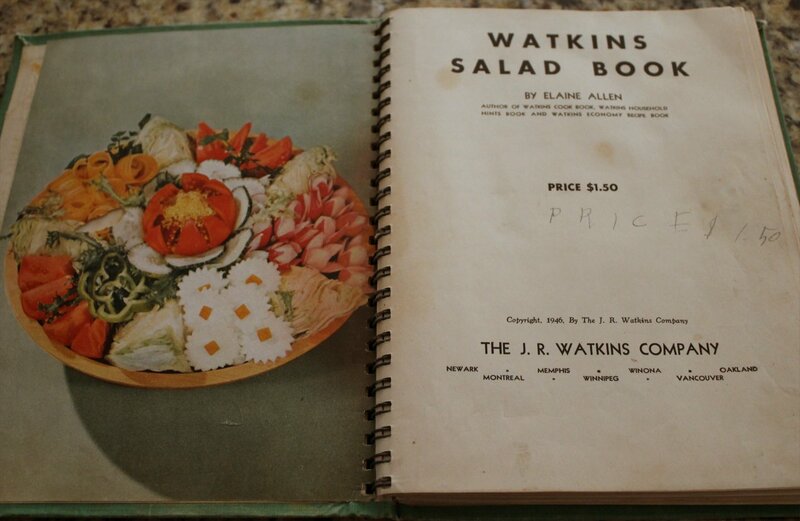 I have a deep abiding love for vintage cookbooks, as well as a long-standing love affair the JR Watkins brand. This book was like a long-lost star-crossed love at first sight thing for me. When I opened my box, I was stunned to find the book with its purple post-it note. Heart be still. 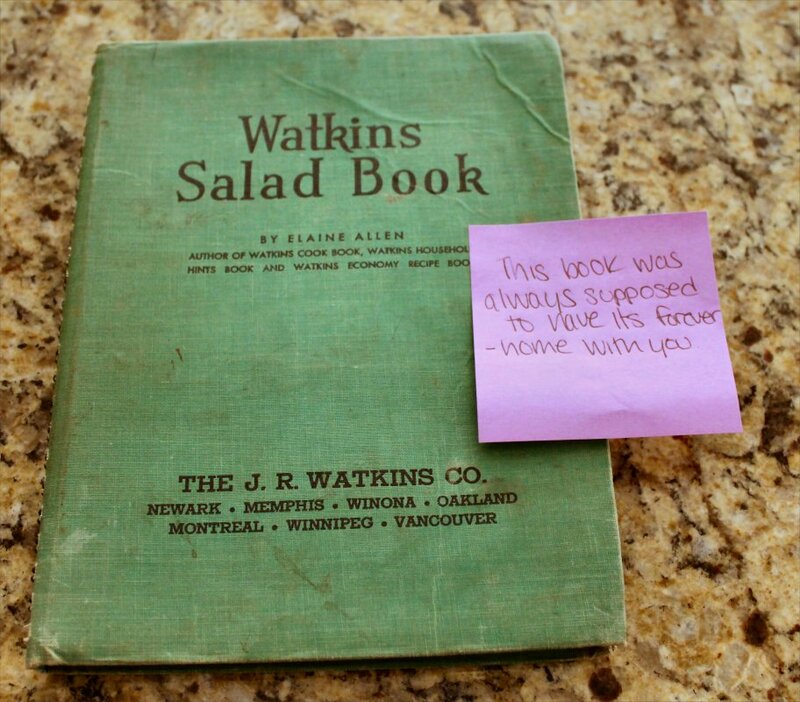 It’s a salad cookbook; copyright 1946. In case you’re wondering, yes there are ingredients listed that I don’t believe exist any more & yes, there’s a lot of mayonnaise throughout the book. But I’m not afraid of a little mayonnaise, and you should know by now that I always play around with recipes. So hello, 1946. Let me introduce you to a little thing called fat-free Greek yogurt. Booyah! Salads from the 1940’s; how fun is that? Another unexpected surprise: while flipping through the cookbook, this gem fell out. 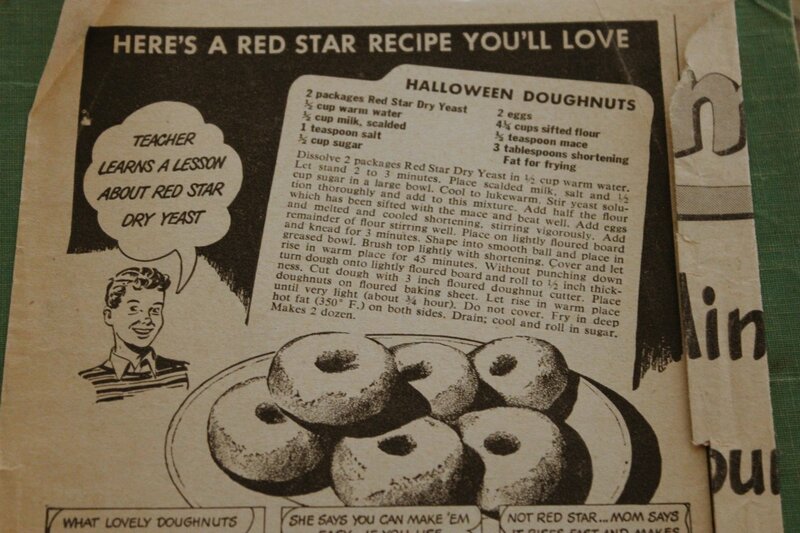 It’s a recipe from a magazine or newspaper circa the 1950’s, and it’s for Halloween Doughnuts. Just before Halloween, y’all! Talk about timing! This bonus recipe was tucked inside. Perfect timing! What? Still not sure? What if I show it to you like this? All sliced up and ready to face-plant into? Does that help? 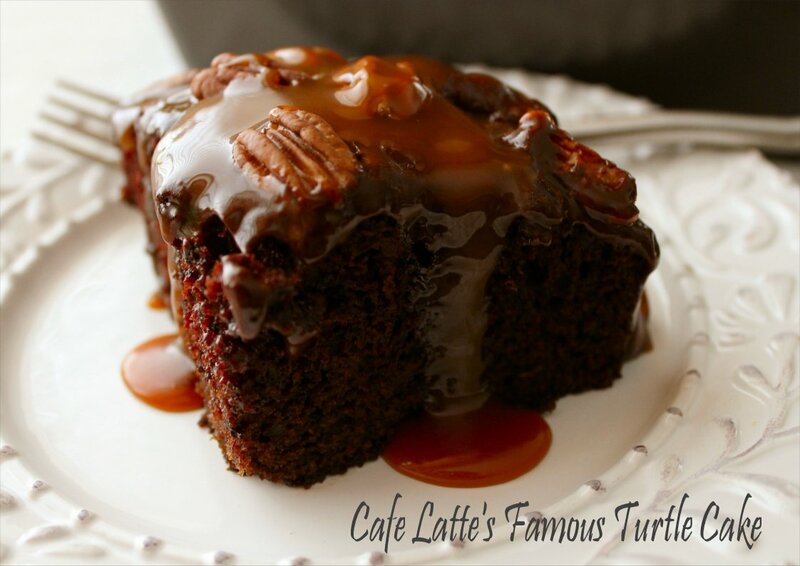 Did I mention it’s all soft and gorgeous on the bottom, and all fudgy and caramel-coated on top? Now are you interested? Yes, it is as rich and gooey as it looks. Okay, I’ll put on a pot of coffee and wait for you. Who am I kidding?! This cake is GONE! G-O-N-E gone. Don’t despair, my lovelies. 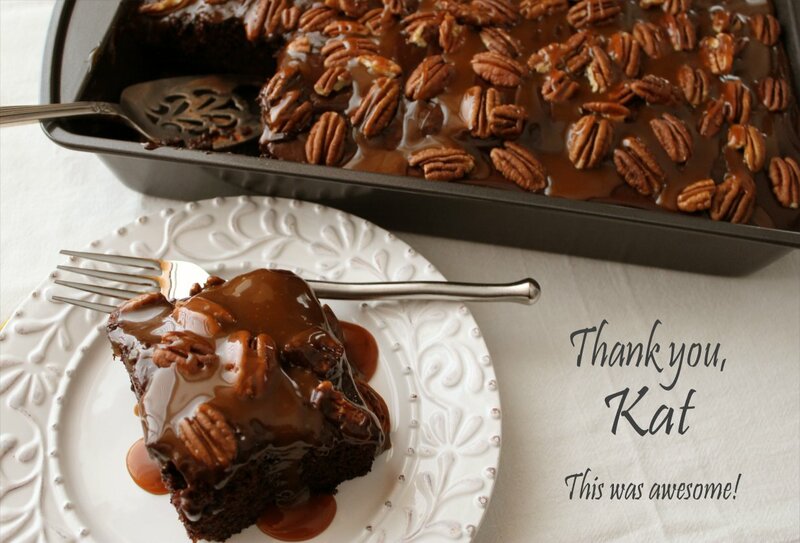 Kat included the link to the recipe on her blog and I’ll share it here, too. Just click here for the recipe. Note: the recipe calls for this to be baked in three 9″ round pans. 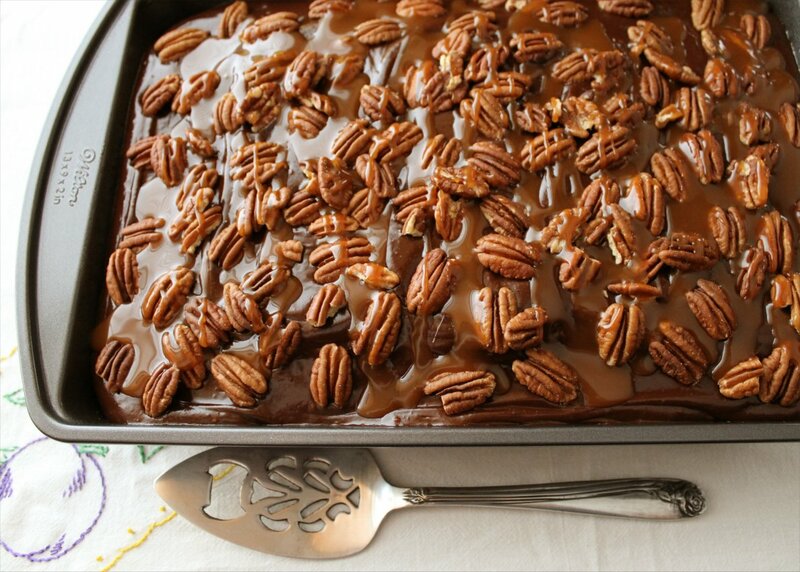 I baked it in a 13″x9″ pan (baking time changes to 35 minutes, in case you’re taking notes). 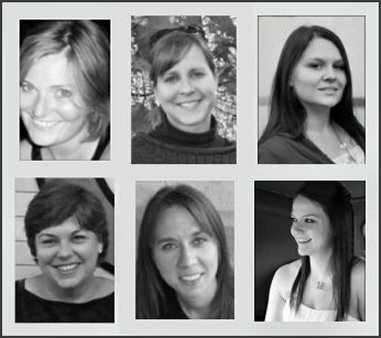 Next month, in celebration of the holidays, we’re rocking OKMH “Secret Santa” style. Boxes will arrive in December with no advance notice of who will be shipping it. When I say “I can’t wait!” I mean it; I’ve already been crafting cute holiday things for my secret recipient. Until then, see what I sent to Allison by clicking here, and you can follow the chain from blog to blog to see what everyone else got, as well. Now… where did I hide that last piece of cake?